The process of blow molding follows the basic steps found in glass blowing. 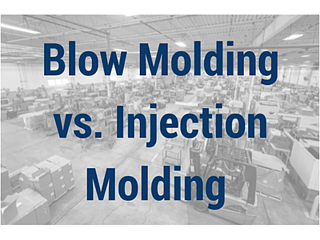 The blow molding process is designed to manufacture high volume, one-piece hollow objects. If you need to make lots of bottles, this is the process for you. 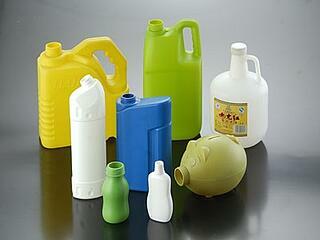 Blow molding creates very uniformly, thin-walled containers. And, it can do so very economically. With blow molding, a plastic tube is heated and filled with air until it essentially becomes a balloon of hot plastic called a “parison.” A mold is then clamped around this, trapping the plastic while air continues to fill the parison into the shape of your part. The size of the machine and associated costs to produce a blow molded product is based on the weight of the plastic shot used in the mold. Blow molds have more design freedom between mold halves since each mold half forms its own wall shape. With blow molding, creating the mold is important but there are variables as well such as wall thinning, air leaks, flash, and streaks that must be monitored. For example, wall thickness variation is often an essential factor for product designers to consider. Quality control is an important part of the process. And, it’s important to look for a supplier that is qualified and trained to measure, monitor, and improves every aspect of the product. Examples of parts and products that are created using blow molding include water bottles, shampoo and other small bottles, automotive parts, stadium seating and chairs, watering cans, coolers, or any other type of hollow parts. 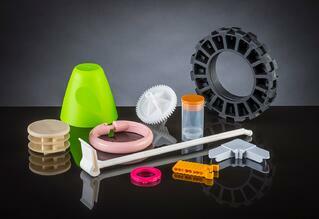 Injection molding requires a great deal of upfront engineering to develop detailed tooling or molds. Crafted from stainless steel or aluminum, molds are injected with liquid polymers at high temperatures under extreme pressure. The molds are then cooled to release complete plastic parts. Plastic injection molding is ideal for high-volume orders and mass production in projects requiring thousands or even millions of the same part. Injection molds must have a high precision match between mold halves, so material flow is perfectly controlled. With injection molding, creating the mold is the key to building a perfect, precision part. When the production mold is finalized, and the machine is prepped, manufacturing begins. An initial run will be thoroughly examined for any part defects. If none are found, full production can begin. Depending on the part and the agreement with the molder, quality checks can take place on a regular basis. They will check for strength, color correctness, and any common defects that can occur like flash or warping. The precision of an injection mold generally makes it more expensive than a blow mold. At Rodon, we specialize in close-tolerance injection molding of small plastic parts, and provide a total concept solution from design and tooling to production, fulfillment, and packaging. The combined effort of our designers and toolmakers results in molds that ensure quality, precision tolerances, and optimized cycle times. We have the capacity to mold parts with complex geometries and variations in wall thickness. Our maximum part size is 10” square, although our major concentration revolves around parts with smaller dimensions. When sourcing for a molder, we often recommend ThomasNet as an excellent platform for supplier and product searching. With over 500,000 suppliers, you'll easily be able to find one that matches your needs and requirements.